Something well above the road caught our eye while driving through the Drôme department of France. It’s a bird.. it’s a plane.. it’s a Citroën Traction Avant? We turned around and much to our bemusement, a Traction was indeed parked on the roof of what initially appeared to be an abandoned building. 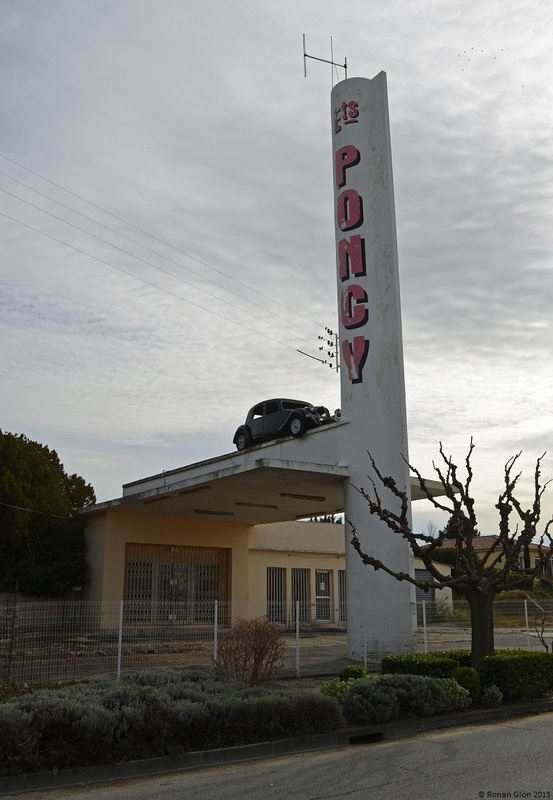 A little research revealed that the business, called Etablissements Poncy, sold ignition and carburetor parts for a vast variety of European cars. It closed down in early 2003 so it is not as abandoned as it might seem at first glance. A good look at the photos sheds light on several helpful clues that allow us to date the Traction: It sits on steel wheels with four vents, it wears a straight and narrow front bumper and a last-gen grille and it has a large trunk lid. The puzzle pieces indicate that we’re very likely looking at a 11D Normale built between 1955 and 1957, making it one of the last Tractions built. The paint chips hint that the car started its life dark gray and was painted flat black prior to being used as Poncy’s display. It has been stripped of nearly all of its trim pieces, including the Citroën chevrons on the grille, so with a little bit of luck parts of this car might still live on today. I love such road-side buildings. What might it have been initially, maybe a petrol station from the fifties? Simple lines, yet the “tower” shows such optimism. The building, like the car, relict from a different times. It used to be an auto parts store, it closed in 2003. Interesting article, I like some of the older abandoned garages that are showcased in it. The blue Citroen U23, that’s about 20 mins away from me, I drive past it on a semi-regular basis. Oh, I wish I could drive there again. In 1997 we took the former RN83 from Mulhouse to Lyon, then a bit of autoroute around Lyond and then the RN7 until we came close to Pont-Saint-Esprit, when we left the RN7 and continued on to Verfuil/Monteze. It was probably the most beautiful car drive of my life – how the villages and towns looked, the history and tradition it radiated, how the scenery enchanted me, and how it changed from north to south. And one could see how important the route once was before the autoroutes were build: many hotels and restaurants, some still open, some closed for long, many in various states of disrepair. I doubt life was better back then (and I lived long enough at a major road to value the quietness I now have here) but the migration of traffic from route nationale to autoroute left a sizable hole in the life and economy of many people. I just recently “found” (in GoogleMaps) the petrol station were we filled up our car on the drive to the south. It was in Donzère, at the intersection with the D541. It was a small station, at the end of a parking space of what once was probably a supermarket. And even back then in 1997 it looked as if it was operating on borrowed time. Today the station is almost gone, only the roof can be seen now, and some concrete were the pumps used to be. Somehow this station left a lasting memory and I am glad I found it. In case you want to see, but it wasn’t a beauty and its charm is probably only for me. Where can this Traction be found exactly (assuming it’s still there) ? Check your emails, I sent you a Google Earth link to the place.